Data encryption and decryption is a cumbersome process and they do not have easy tools for it. They do not have time to add one more step into their already busy life. They do not want to add one more password to remember. They do not need it as “It” will not happen to them. Whatever be the reason, but we suggest that you to seriously consider file and folder protection as a habit specially for protecting your sensitive data and information. You never know when you may need it. 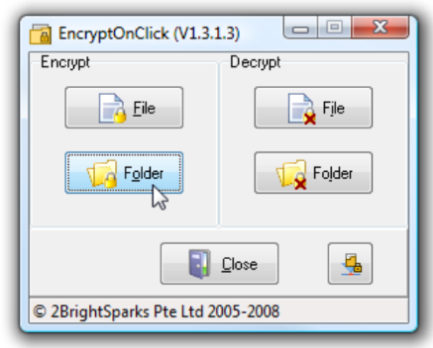 In case you are looking for a easy and simple tool for file and folder encryption, then you can try EncryptOnClick. It is a simple freeware tool, which allows you to encrypt and decrypt your files and folders with a simple click. The user interface is so simple that even a small child can operate it. There are just boxes – Encrypt and Decrypt with just two options in each box – Files and Folders. Just choose whatever is your requirement and you are done. Simple. EncryptOnClick quickly and easily locked our files from anyone without the password, but the program wasn’t without its faults. The biggest trouble spot was the fact that once the password is entered and the file is decrypted, it remains open permanently. This means users must physically find the file and set the password each time it is opened. Other downloads keep the file encrypted until told otherwise. Another area where this program didn’t meet the competition is its algorithm for encryption. More-advanced downloads offer a choice for users who wish to select the level of complexity their program is encrypted.